AppRaisin is a new Windows 10 app from the same guys that run AdDuplex, and it’s meant to fill the niche that the now defunct Nokia App Social left when it closed down back in 2015. It’s meant as a discovery platform where users send links to newly launched (or recently updated) UWP or Windows Phone apps and then they are voted (“raised”) by the community. The most popular ones raise to the top of the list so they have more visibility, and you usually can see yesterday’s best apps in between today’s raising ones. Oh, and it’s entirely free. My experience with it has been extremely positive so far. 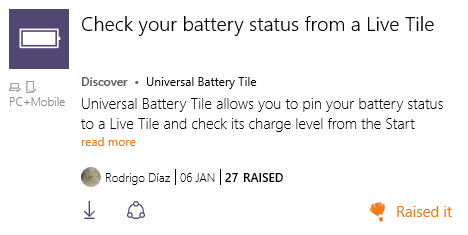 Everything begins back in November 2015, when I attented the Submit It hackathon in London and made a small UWP app: Universal Battery Tile. My idea behind it was to ship a really simple first version and then iterate with new features from time to time; also, I would try to focus on monetization and marketing too, making some of the new features available only to paid users and trying to promote it enough when it reached a more complete state. The app was soft launched during the hackathon, and no promotion was done at all except for including AdDuplex banners. Some days later, a Russian site reviewed it, which provided a small bump in downloads. And at the beginning of January, with a bigger update that changed the UI by adding a hamburger menu, I decided to try luck and send it as an “app discovery” to AppRaisin. The results were better than expected. The news item was submitted to AppRaisin on the 6th of January, and it had 24 raises that day (with some more coming later). It was at the top of the discovery queue for some time, until more popular items took its spot. This brought a good amount of downloads. As you can see from the graph above, the app got ~190 downloads in a single day, almost 5 times more than the 40 that it got by being reviewed. And with the extra downloads on the following days for being still discoverable, it amounted a total of 400 or so. Not all of them ended being final or recurring users, though, as you can see from the Azure Application Insights graph below; still, the average daily user base grew from 100 to a whooping 250. And the best part? 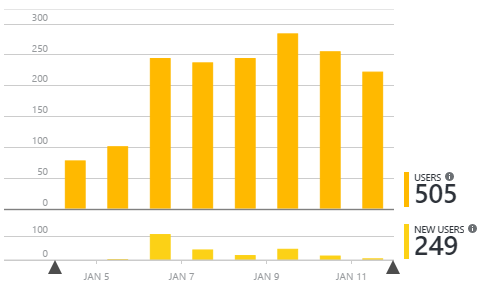 AppRaisin also automatically applies a campaign tracking tag to submissions, so you can know afterwards how many conversions your app had thanks to promoting it (although it seems to be a bit broken on the Dev Center side, since the picture below shows only 5 IAP conversions, but the reality is that I got 17 purchases during those days – an awesome 4% conversion ratio that doubles the usual 2%). So, what are you waiting for? It’s free, it takes literally 5 minutes to link your app and write a short description about it or the features on the latest update, and there is a huge (and growing) user base that checks AppRaisin for new apps. Added support for Windows 10 Universal Windows Platform apps. Added the option to reset the counter when the app is updated (thanks @timothystewart6 for the contribution!). Added a new SendFeedback dialog for asking the user to send an email containing valuable feedback. There is one breaking change, the RatePopup.CheckRateReminder function changing its name to RatePopup.CheckRateReminderAsync and now returning an enum value that tells if the dialog was not displayed, if the user chose to rate the app or if it was dismissed. If the user chooses not to rate the app (or if you want to use it in other parts of the application), you can now show another pop up for asking to send an email containing feedback. For this, use the FeedbackPopup.ShowFeedbackDialogAsync function. As always you can download it from NuGet or if you want to take a look at the source code or samples provided (or even contribute! ), check its GitHub repository.